The political future of the European bloc looks distressingly rough. Already in a December 2016 essay published in the Financial Times, Wolfgang Münchau warned that the “liberal capitalist order” was in peril of capsizing under what he called “uncontrolled flows of people and capital.”1 The mere fact that Münchau described these flows as “uncontrolled” signals a darkening mood in the West.2 The preferred term for a rapid and fluid circulation of capital and people in the post–Cold War order is—or at least was—“free.” The neoliberal world order is committed to, and predicated on, a free movement of people and of capital. Borders are barriers, and barriers disrupt or inhibit movement. This is definitional. It is therefore predictable that a financial, legal, and bureaucratic formation such as the European Union would generate an intellectual elite, and inculcate a forma mentis, which finds it difficult or impossible to legitimize—or even to theorize—borders. My intention here is to begin to reexamine the problem of borders in contemporary European politics—and obliquely, in American politics—by means of a pair of early modern political novels: Thomas More’s Utopia and Francis Bacon’s New Atlantis. We now tend to think of borderlessness as the “utopian” ideal, but early utopian fiction is fixated on borders. It might be possible to argue that More and Bacon’s intense concern with borders—on which, more presently—is conditioned by the nascent mercantilist world-order of the sixteenth and seventeeth centuries. Early modern political economy was arguably no less obsessed with accumulation—and thus, in its way, with borders—than our neoliberal world order is now fixated on circulation—and borderlessness. It is not my aim here, though, to explore the historical context or causes of the border regimes in Utopia and the New Atlantis. The basic datum that interests me is this: in antiquity, and again in early modernity, insulation is regarded as a conditio sine qua non of political and social perfection. We might recall that the English word “insulate” is derived from the Latin word insula, “island.” And as I will show, Thomas More is at great pains to make his “Utopian Republic” an island polity.3 Bacon imitates More, in this respect, in his New Atlantis. The utopian genre is half-satirical, a kind of “serious play” (serio ludere). The genre’s bite and extravagance is crucial to any interpretation, but its formal traits are conditioned by a deeper intent: legal and political critique. Beginning with More, the purpose of the modern “utopia”—a harmonious place which is “no place” (in Latin Nusquama,4 and in Greek Ou-topos)5—is to distance us from our own inharmonious place, from the clanging imperfections of a social order that we have both inherited and constructed. There is reason, then, to engage the early modern “utopian” critique of free movement in a tense and fraying, contemporary context. The utopian genre might help us to understand the current, fractious state of Europe. Note, too, that it is the Europeans’ first encounters with the Americas that sparked a revival of the “optimal-city” genre of antiquity, and that gives the genre an unmistakably modern cast. In More’s and Bacon’s texts—and in this essay—America is on the horizon. Given the genre’s critical function, the purpose of this essay is to ask, in a preliminary way: What is the utopian logic of borders—that is to say, of social and political insulation? For, if the early modern figure of a “utopia” has anything to contribute to political thought in our geopolitical moment, it may have something to do with the conception and protection of borders. More’s report on “the new island of Utopia” (Nova Insula Utopia),8 and Bacon’s fable of a New Atlantis, are not only notable in terms of intellectual history. Both were written by philosopher-statesmen of the first rank: More and Bacon were both Lord Chancellors of England. In a certain sense, then, both texts have a place in the political history of Europe and the Americas. The term “utopian” still has currency in policy circles, and twenty-first-century politicians treat “utopia” as a concept with real-world political meaning—however that meaning may be assessed. In this, if in nothing else, the term remains true to More’s subtle and oblique, but genuine, intentions. Towards the end of Utopia, More has his narrator, Raphael Hythloday (the surname is a cunning Greek portmanteau meaning, roughly, “babbler”) say that “the whole world” (totum orbem) should “adopt Utopian laws,”9 specifically the abolishment of money.10 Whatever ironies may distance More from this claim, there is no denying that he hopes in some way to influence the political order of early modern Europe. His island republic is conjured up as a source of possibilities for a vast European “republic,” the respublica Christiana, which arguably still existed in 1516, but began to irretrievably crack up in 1517 with Martin Luther’s challenge to Rome. It is precisely in light of More’s continental or even global hopes that the border regime of his Utopia must be seen. There is no contradiction, for More, between a dream of political insulation and passionately held geopolitical aspirations. On the contrary, in Utopia, it is a vigilantly guarded political insulation which gives rise to geopolitical aspiration. More may wish that the “whole world” would eliminate money, for instance, but it is only because his republic is cut off from the “whole world” that it has succeeded in eliminating money. Such, at least, is the conceit. A great deal of More’s ingenuity in Utopia goes into devising a trade policy. Utopia is in the global economy, but not of it. The island republic has amassed a vast fisc of foreign currency yet has no currency of its own. The Utopians despise gold, using it to make chamber pots and manacles.11 (This is of course a mercantilist’s nightmare.) If the Utopians conducted trade on the terms set by global custom, they would be corrupted. In order to have a domestic economy which “the whole world” should imitate, the Utopians have to shelter it. Intriguingly, on the question of protectionist trade, a line could be drawn from Plato’s Laws, through More’s Utopia, to J. G. Fichte’s Closed Commercial State.12 The connection is not hard to discern: Fichte cites Plato and More in the first pages of his book. And Platonic political economy is a hard-headed tradition. It treats monetized trade as intrinsically political, since law is a precondition of commerce. But it also treats monetized trade as intrinsically anti-political. For, in legal and political terms, commerce liquidates. We see this most recently in the rise of cryptocurrency. Monetized trade is now threatening to liquidate money itself, since state-issued currency is a politically marked medium of exchange. Plato would not have been shocked by this. Nor would More, who was a close reader of Plato’s Laws (a systematic influence on both Bacon and More).13 Hence there is no domestic currency in the Utopia, and trade policy is basically conducted in a Platonic way. Fichte’s proposal seems to follow both Plato and More, and he seems to have influenced John Maynard Keynes’s interwar thought. “A gradual trend in the direction of economic self-sufficiency,” Keynes wrote in 1933, “may be more conducive to peace than economic internationalism.”14 Keynes seems to balk at the term “economic nationalism.” Still, he thinks that something other than “economic internationalism” may be in the interests of a peaceable and durable world order. Whether or not he is right in this, Keynes exemplifies here the Utopian principle that political insulation can be a means—or, at least, can be advocated as a means—to humane geopolitical ends. This is worth remembering in the current political climate. That this artificial channel is no minor detail is confirmed by the first line of a quatrain by Peter Giles (a member of More’s humanist circle in Antwerp) which appears in the first pages of Utopia’s earliest editions. 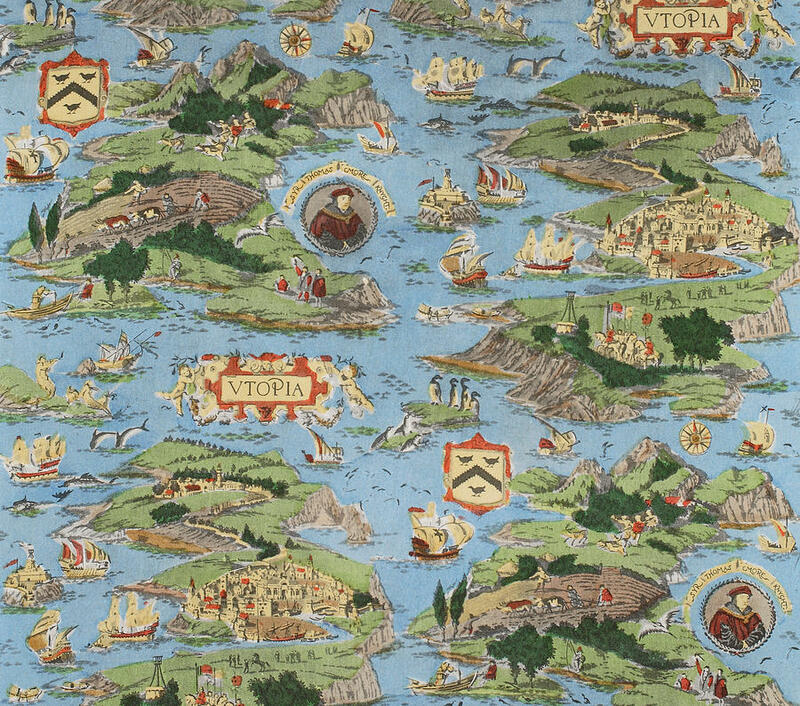 “It was Utopus,” writes Giles, “who made me [Utopia] an island from a non-island” (Utopus me dux ex non insula fecit insulam).22 Having conquered a peninsula, Utopus makes an island, so strong is his conviction that an ideal polity must be insular. Is this More’s dream—or joke—of a 2016 British referendum, exactly five hundred years in advance? In any case, the fortifications continue within More’s artificial island. Utopia’s cities are all “built on the same plan,”23 says Hythloday. Each is “surrounded by a thick, high wall.” This wall is then protected “on three sides . . . by a dry ditch,” while a river “serves as a moat” on the fourth side.24 Hythloday specifies that in Amaurot—the city that marks “the navel of the land,”25 and in which he lived for five years—“the inhabitants have walled around the source of [the] river” that passes through their city, “so that if they should be attacked, the enemy would not be able to cut off and divert the stream, or poison it.”26 In Utopia, even the rivers are walled in. It is clear from Hythloday’s report on Utopian warfare that wall-building is a warlike practice. “They fortify their camps thoroughly,” he says later in Book II, “with a deep, broad ditch all around them” (just like their cities). Hythloday is struck by the fact that this labor is not performed by slaves, but “by the soldiers themselves with their own hands.” The citizens of Utopia are masters of the maligned art of wall-building, and Hythloday is amazed at the speed with which they “complete great fortifications, enclosing wide areas with unbelievable speed.”27 Why is this? Why is Utopia an artificial island, and a fortress? Much more could be said, but this demonstrates that Utopia is not a xenophobic republic. The Utopians regard “humanity” (humanitas)—this is More’s term—as “the virtue most proper to human beings,” and hold that “nothing is more humane . . . than to relieve the misery of others.”34 Yet, if humanitas is Utopia’s highest virtue, then why is it encircled by water and fortified on land? Isn’t a prohibitive border regime in conflict with the Utopians’ humanitarian ethic? More does not himself take up this question, but in the New Atlantis, written roughly a hundred years after Utopia, Francis Bacon does. In any event, the dramatic date of Bacon’s political fiction is 1612,37 and the intervening century is signaled in its first sentence. “We sailed from Peru,” Bacon’s narrator begins, “for China and Japan by the South Sea.”38 When More wrote Utopia, the globe had not been circled by the Magellan expedition (1522); Peru had not been overrun by Pizarro (1532); and Japan had not yet been reached by Mendes Pinto (1542). As a Pacific (“South Sea”) route from Peru to China suggests, then, Bacon’s island republic is situated on a newly traversed—but not yet fully charted—globe. This term, the significance of which we just noted in Utopia, recurs throughout the disembarkation drama in New Atlantis. The border guards of Bensalem are noted for the “rare humanity,”45 and more emphatically, for the “singular humanity” with which they treat the pathetic Europeans.46 Later, when the narrator and his crew are still under strict surveillance, having completed a short period of house arrest, they marvel that they have been met with “such humanity, and such a . . . desire to take strangers as it were into their bosom.”47 If this is not a Wilkommenskultur, what is? Still, a sharp tension between humanitas and the robust enforcement of a centuries-old border regime is salient in Bacon’s text, as evidenced by how foreigners are “processed,” for lack of a better word, in Bacon’s island republic. The next morning, Bacon’s crew is brought ashore. They are greeted in the city by crowds of islanders “standing in a row, but in so civil a fashion”—says Bacon’s narrator—“as if it had been not to wonder [at] but to welcome us.”51 Over a period of days, they are installed in the Strangers’ House, which the narrator describes as “a fair and spacious” structure.52 They are instructed not to leave this house for a period of three days. This house arrest is the fifth element in Bensalem’s border regime. Having passed these days quietly, the Europeans are then visited by the governor of the Strangers’ House, who informs them that “the state hath given [them] licence to stay on land for the space of six weeks.” There is one new condition, however, which the governor lays down: “None of you must go above . . . a mile and a half from the walls of the city.”53 Having been confined to the Strangers’ House for a period of three days, they are now—for a period of six weeks—confined to the city and its vicinity. With the narrator and his crew installed in a specially designated house and free to move about the city, the dramatic frame of Bacon’s New Atlantis is in place. His narrator can then observe Bensalem’s rites, consult its scholars, and so on. But what is the logic of this border regime? It is marked by a concern with “mercy” and “humanity,” yet its objective is the “rare admission of strangers.”54 Bacon’s narrator is told that thirty-seven years have passed since a stranger appeared in Bensalem’s harbor.55 Even after thirty-seven years, however, the island’s border-regime is vigorously enforced. More’s concern with stability is of special interest. More believes that different “institutions” (institutiones) inculcate different “affections” (affectiones),77 and his ideal polity is predicated upon affections. More’s border-regime is meant to ensure the internal and institutional stability of his island polity by providing for the stability of the Utopians’ affections. Borders do not only demarcate forms of governance, but forms of affectivity. This is reflected in Hythloday’s report on Utopian marriage customs. Especially striking is one comment. “There is extra reason for them [the Utopians] to be careful,” he says here, “because in that part of the world they are the only ones who are content to practise monogamy (singulis sunt contenti coniugibus).”78 The practice of monogamy is not merely, for More, a question of law. It is a question of contentment which is inculcated by the law, and which undergirds the law. The form of affectivity that makes More’s island republic a utopia is—in his own conception—no more durable than its borders. In this respect, More is absolutely faithful to Plato, and Bacon is faithful to More. This becomes, finally, the basic intuition of all utopian fiction: the perfect modern state—like the optimal city of antiquity—is sheltered by strong borders. Today, when those most responsible for the fate of migrants (in this case, the United Nations) feel compelled to warn that uncontrolled border crossings are being used by hostile entities to destabilize states,79 this aspect of utopian writing may prove to be—unhappily—the most timely. But a borderless utopia is, paradoxically, a contradiction in terms. In order to be “no place” (Ou-topos), More and Bacon insist that you must first make a place (even if it means digging a faux English Channel, like Utopus). Global history is dystopian, they conclude; less of it is more. Borders can shelter us, for a while, from the chaos of history. And in this sense—is it minimal? or is it maximal?—borders can be utopian. 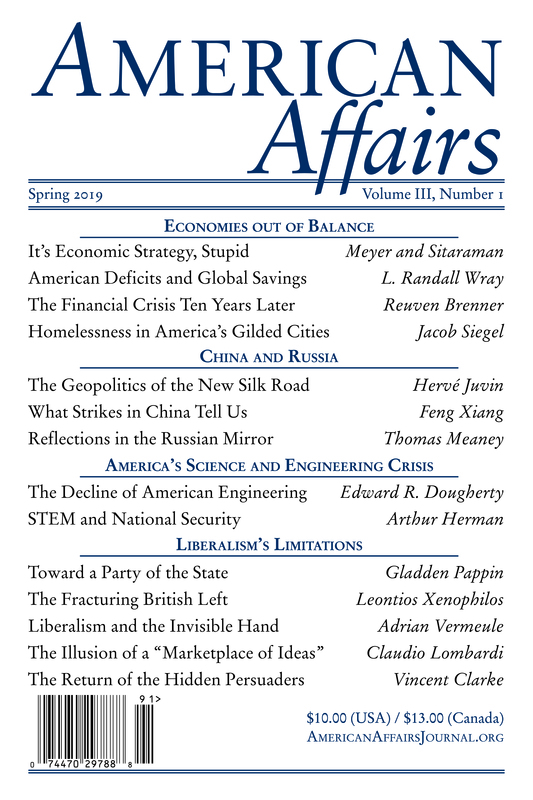 This article is an American Affairs online exclusive, published November 20, 2018. 1 Wolfgang Münchau, “The Liberal Elite’s Marie Antoinette Moment,” Financial Times, November 27, 2016. 2 J. Zielonka, “Europa ist nicht länger sicher. Alles kaputt: Nato, EU und auch der liberale Konsens,” Die Zeit, December 16, 2016. 3 Thomas More, Utopia, ed. G. M. Logan and R. M. Adams (Cambridge: Cambridge University Press, 1989), 109. 5 J.-Y. Lacroix, L’Utopia de Thomas More et la Tradition Platonicienne (Paris: J. Vrin, 2007) 11. 6 J. Hilton, Lost Horizon. A Novel (New York: Harper Perennial, 2004), 205. 8 See the title page of the 1518 edition reproduced in Prévost, 309. 9 More, 109; Prévost, 628–29. 10 More, 109; Prévost, 626–27. 11 More, Utopia, p. 61–63; Prévost, L’Utopie de Thomas More, p. 494–503. 12 J. G. Fichte, The Closed Commercial State, tr. with comm. A. C. Adler (Albany: State University of New York Press, 2012). 14 I. Nakhimovsky, The Closed Commercial State: Perpetual Peace and the Commercial Society from Rousseau to Fichte (Princeton: Princeton University Press, 2011), 172. 15 More, 42; Prévost, 448–49. 16 More, 42; Prévost, 448–49. 17 More, 42; Prévost, 448–49. 18 More, 42; Prévost, 450–51. 19 More, 43; Prévost, 450–51. 20 More, 43; Prévost, 450–51. 21 See J. H. Hexter, “The Composition of Utopia,” The Complete Works of St. Thomas More, Volume 4, ed. E. Surtz, S.J. and J. H. Hexter (New Haven: Yale University Press, 1965), 386. 22 More, 123 (translation modified); Prévost, 334–35. 23 More, 44; Prévost, 452–53. 24 More, 46; Prévost, 460–61. 25 More, 44; Prévost, 452–53. 26 More, 46; Prévost, 458–61. 27 More, 94; Prévost, 584–87. 28 More, 40–41; Prévost, 444–45. 29 More, 40; Prévost, 442–43. 30 More, 58; Prévost, 486–87. 31 More, 79; Prévost, 544–45. 33 More, 79; Prévost, 544–45. 34 More, 70; Prévost, 516–17. 35 Hexter, xv–xxiii. Or, as it was originally called, Nusquama (“Nowhere”). See More’s letter to Erasmus dated September 3, 1516, quoted and discussed in Hexter, xv–xvi. 36 B. Vickers, Francis Bacon (Oxford: Oxford University Press, 1996), 786–87. As Vickers notes (p. 785), the New Atlantis first appeared in 1627, at the back of a posthumous volume overseen by Bacon’s chaplain, William Rawley. The bulk of this volume is made up by Bacon’s Sylva Sylvarum: or A Natural Historie. 37 Francis Bacon, New Atlantis, in B. Vickers, Francis Bacon (Oxford: Oxford University Press, 1996), 467, 792. 39 Thus anticipating “Salomon’s House,” which is “sometimes called . . . the College of Six Days Works.” Bacon, 471. 42 Note, in passing, that, like the old “Atlantis” described in Plato’s Critias, Bacon’s New Atlantis is an unfinished text. See the title page: New Atlantis: A Work Unfinished, reproduced in J. Spedding, R. L. Ellis, and D. D. Heath, The Works of Francis Bacon, (London: Longman and Co., 1859 (facsimile edition: Stuttgart 1963)), vol. III, 125. 50 More, 58; Prévost, 486–87. 57 Plato, Laws XII 950b. See Plato, Laws, 2 vols., Greek with trans. R. G. Bury (London: William Heinemann, 1968), vol. 2, 503. 59 The name is written “Salomona,” but pronounced “Salomon.” See Bacon, 471. 61 Judging mainly by the annotations on this passage in Vickers, 704. 62 Plato, XII 949e–950a. See Plato, Laws, trans. R. G. Bury, vol. 2, p. 500–503. 68 Bacon, 466. The term also appears in the writings of Joseph Hall (d. 1656), Bishop of Exeter and Norwich, and perhaps in other seventeenth-century writers. 74 More, 86 (translation modified); Prévost, 564–565. 75 More, 86; Prévost, 562–563. 76 More, 95; Prévost, 588–89. 77 More, 63; Prévost, 504–05. 78 More, 82 (translation modified); Prévost, 552–53. 79 Daniel Boffey, “ISIS Trying to Foment a Wave of Migration to Europe, Says UN Official,” Guardian, April 26, 2018. 80 Carlo Ginzburg, No Island Is an Island: Four Glances at English Literature in a World Perspective (New York: Columbia University Press, 2000).